Ok, so I'm a glutton for punishment... I like making my ribs from scratch. The Bubble Dancer uses 8-10 lb. 3/16" ribs in the center panel and 8-10 lb. 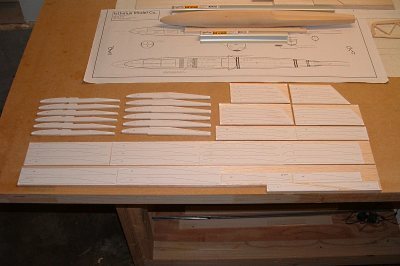 1/8" ribs for the rest of the panels. 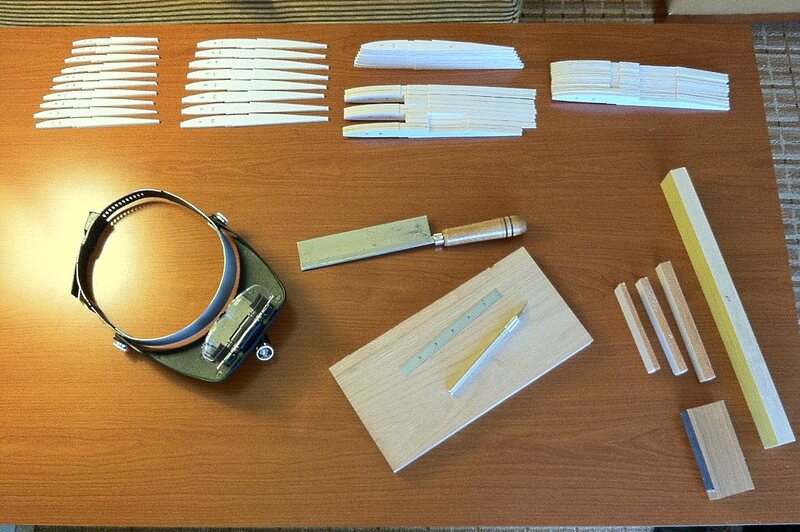 I laid out the opposing ribs(in this picture, #s 1,2 and 3) on the same balsa plank to ensure even weight distribution. Once the papers are cut to fit the plank, I sprayed the rib printouts with 3M #77 and let the paper sit, sticky side up, for about 30 seconds. Then I pressed the paper down onto the balsa. 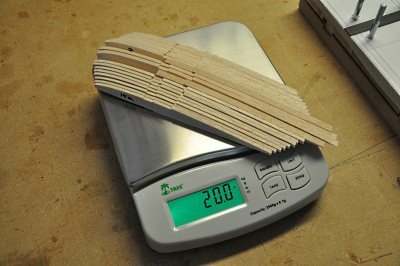 I did all my cutting, sanding and shaping directly up to the printed lines on the paper while it remained affixed to the balsa. The benefit was that all my ribs were conveniently numbered for reference when I was done. 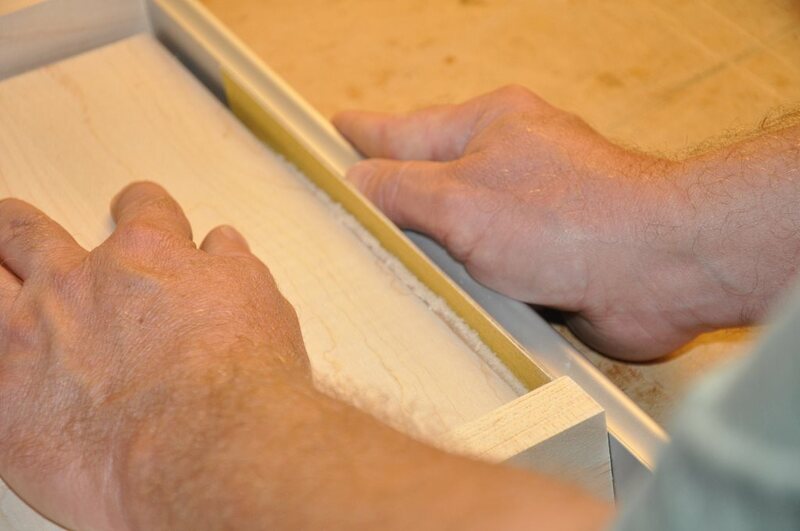 Utmost care must be taken during the detail work to maintain a perfect 90 degree face on all the rib edges. 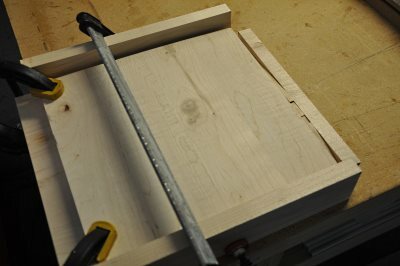 The edge of my bench is conveniently square and works as a guide for my sanding block. For the curved edges, a small square sanding block sitting on the top of the table does the job, by holding the rib still and running the block along the rib. Here was the first rib I finished. Fine tuning of the spar notches was left until the wing panel was dry-assembled. 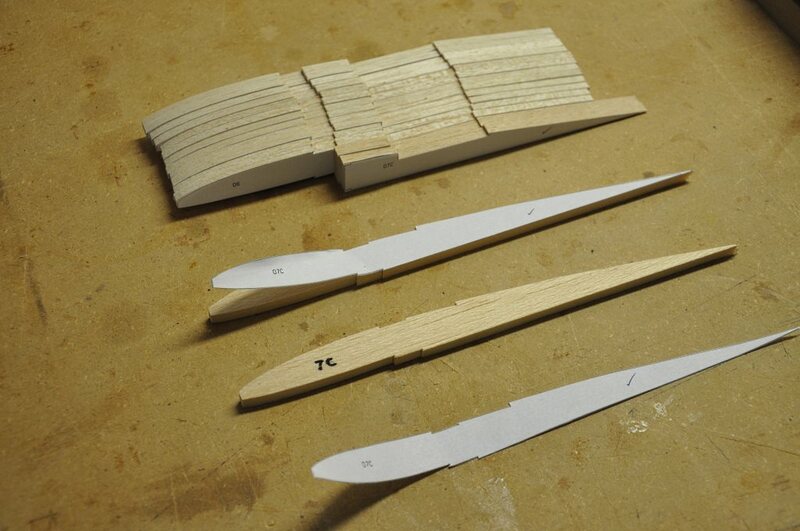 At that time they could be sanded as a group to the precise width of the spar. 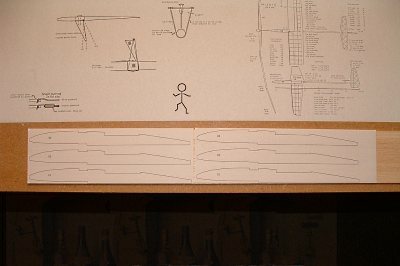 A shot of all the ribs laid out in various states of production. Making the ribs this way was a lot of very detailed work but I think in the end it turned out quite well. As an interesting aside: I was traveling a lot during the time that I made the ribs, and ended doing the tedious repetitive work sitting in hotel rooms. All I needed for a "shop" was a hard work board, my X-Acto blade and my sanding block. All in all, a great way to "keep the project going" even though far from home. 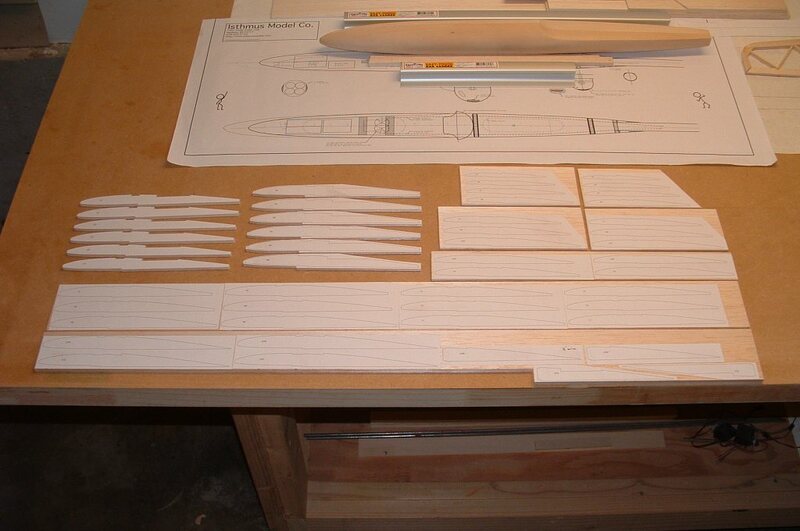 Here we see all the ribs completed and grouped in by their respective sections. Note: If you aren't as "dedicated" as I was, you can order the ribs from Mountain Models for $43. Once you are ready to begin the wing assembly, remove the paper from the ribs. 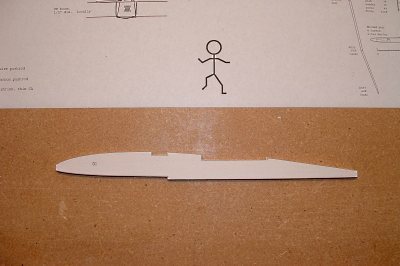 You will still want to know the rib numbers, so write each number on the rib with a marker as you remove the paper. 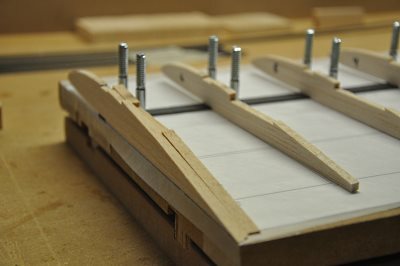 The 8 ribs that are part of each panel break will need to have a 5 degree bevel sanded into them before placement on the wing jig. 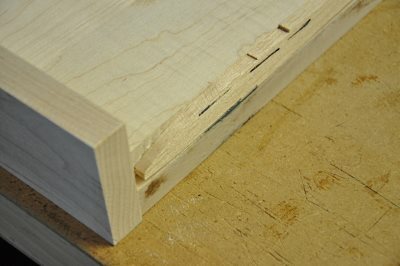 For this job, I made a quick jig out of maple. 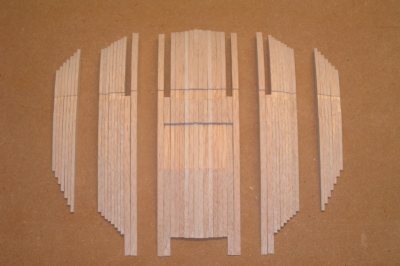 The two side runners have a precise 5 degree angle to them that I can use to sand the ribs (as well as the carbon spar caps, wing joiners, etc. 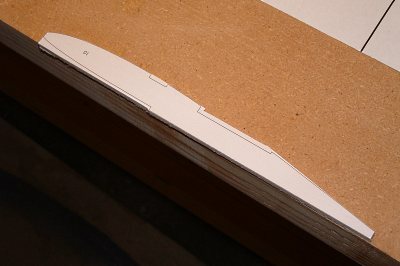 I lined the edge of the rib up with the edge of the jig. Notice that I did a quick black mark on the top of the rib - I did this on opposing faces of the various ribs so that I would ensure that I sanded the bevel into the correct sides. 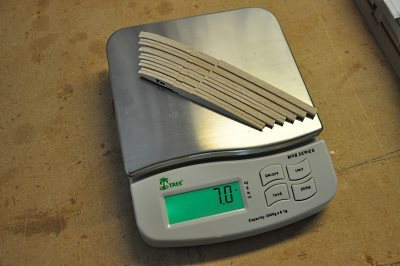 I applied sand paper to only the center section of my sanding block so that the ends of the block could ride on the maple jig runners without sanding the runners. 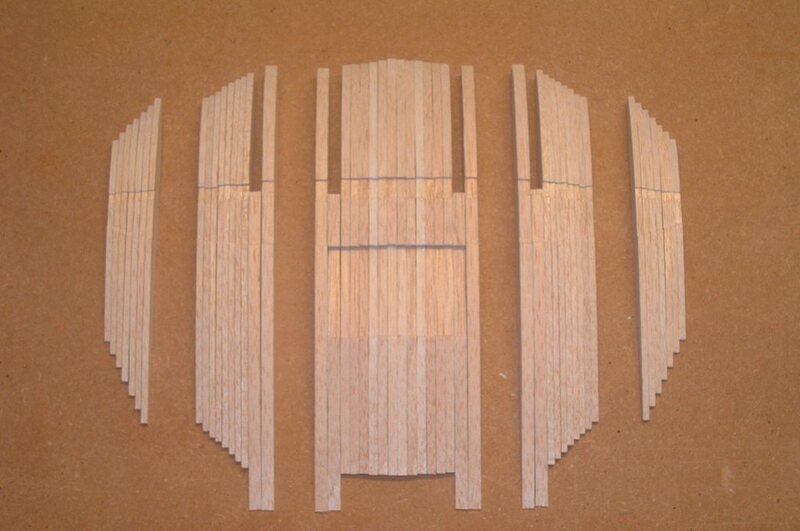 Here is a shot of the 7C rib beveled at the end of the center panel. The rib will later be cut to allow the wing joiner to sit at the end of the panel. 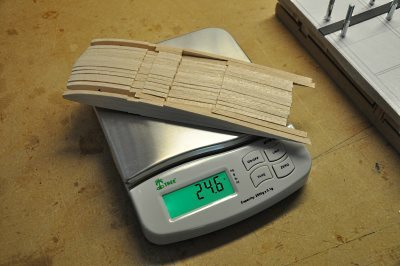 The final weight of these center panel ribs: 24.6 g.
The design target weight is: 32 g.
I was a bit fanatical when I selected my rib balsa - I hope I didn't go too light as Dr. Drela has stated in various places that the balsa weight does relate to the design strength of the build. We'll see. At any rate, I am trying my best to build this plane very, very light. The final weight of my Mid Panel ribs: 20 g.
The design target weight is: 26 g.
Note: the plans say 13 g. - but remember that is for each mid panel - multiply that by two panels and you get 26 g.
The final weight of my Tip Panel ribs: 7 g.
The design target weight is 8 g.